IMPORTANT NOTICE!!! Now departs from Mount Dora Plaza located at 2700 W. Old Hwy 441, Mount Dora, FL 32757. Featuring plenty of FREE parking! 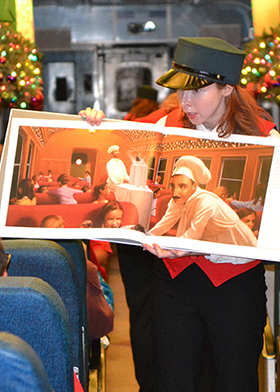 This magical experience takes you and your children to the North Pole on board an actual train ride that recreates ™ movie. 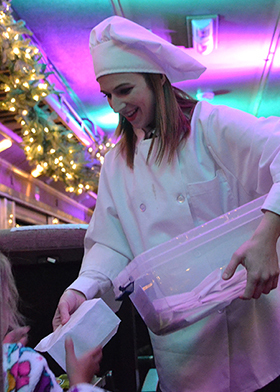 You will have your golden ticket punched by the conductor, experience the dancing chefs who will serve cocoa and a tasty treat, interact with the hobo and other characters from the movie, along with enjoying a reading of the classic children’s book THE POLAR EXPRESS™ by Chris Van Allsburg. 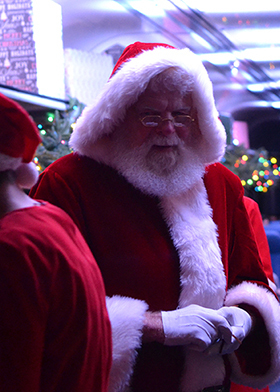 Upon arrival at the North Pole, Santa Claus and his elves will climb aboard and visit each family. Each child will receive a silver bell from Santa’s sleigh as the first gift of Christmas. 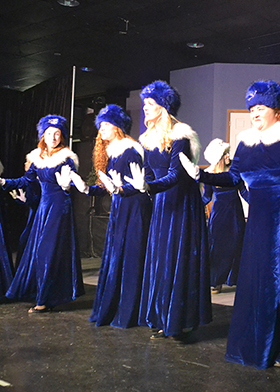 After a rousing series of Christmas caroling, you will return to Mount Dora and reality with a renewed sense of Christmas joy. 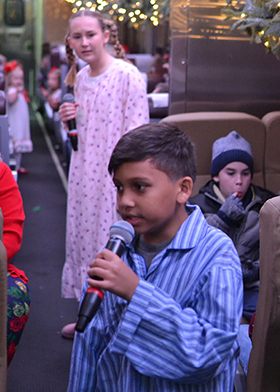 THE POLAR EXPRESS™ Train Ride is a Warner Brothers licensed, music filled theatrical recreation of the movie that has become a Christmas tradition. 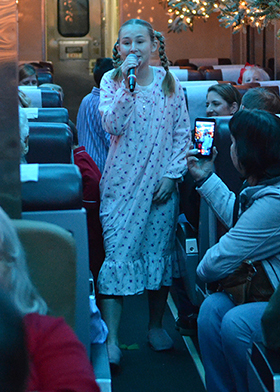 Immerse yourself even more in the magic of your ride by wearing your pajamas, just like the children on the train in the movie! 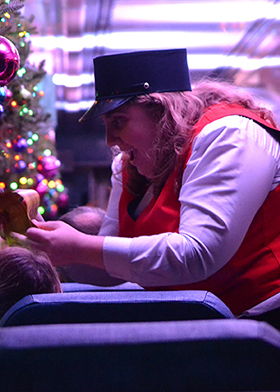 It is a long way from Central Florida to the North Pole, but THE POLAR EXPRESS™ Train Ride can take you there and back in a little over an hour. 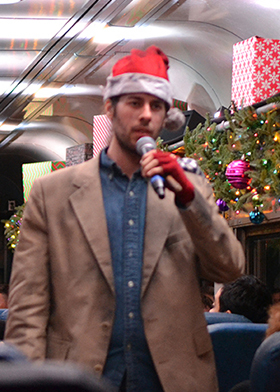 Check-in for each train will begin an hour and a half before the next scheduled departure time. Please plan to arrive early so that you do not miss your selected train. 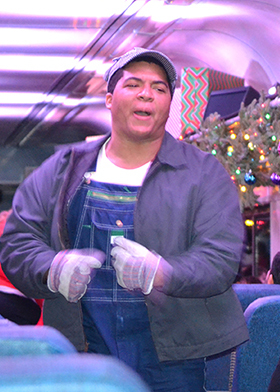 Ticket purchases for The Polar Express™ event are final and non-refundable. The check-in counter will close promptly 10 minutes prior to the next scheduled departure to ensure the on-time departure of that train. The train cannot and will not be held for late arrivals, regardless of circumstances, and it is unlikely you will be able to reschedule for the next train on the same date. Any late arrivals after the close of check-in will be subject to a rescheduling fee of $5.00 per ticket if comparable seating is to available on the remaining scheduled dates and trains. 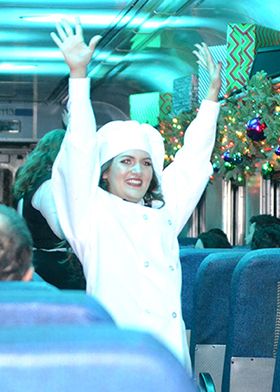 Ticket purchases for The Polar Express™ event are final and non-refundable. Pricing varies by dates and class of service. Coach seating is the only class sold by the single seat. Custom Coach is sold in pairs of two. First Class is sold in packages that accommodate four riders and are seated at a table with the group facing each other. Children under the age of 2 may ride for free provided they are not occupying a seat and ride on an adult's lap. A free infant ticket must be selected at checkout. A ticket is required if the child occupies a separate seat. 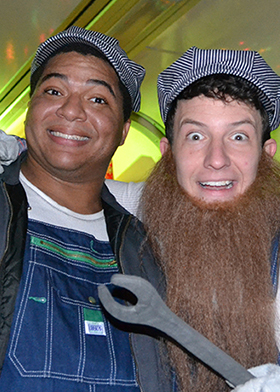 Due to the historic nature of the rail passenger cars used for THE POLAR EXPRES™ Train Ride production, there is limited access to guests with mobile disabilities (American's with Disability Act of 1990 Sec. 12184). 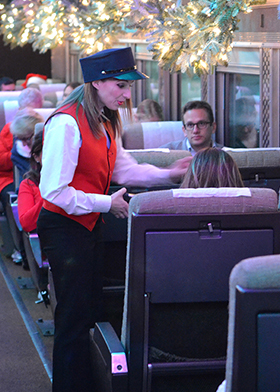 We will make every attempt to keep members of your party together when the purchase is made as a single group, but, due to the seating arrangements of our historic rail passenger cars, we cannot guarantee this. Early purchase of your tickets will provide a greater chance of keeping all members of your party in the same area of the car. 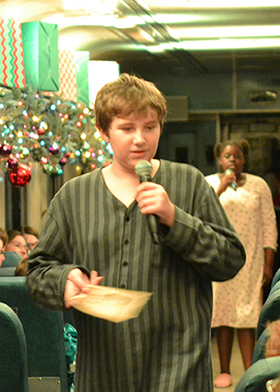 "There would be no Christmas without the Polar Express™ arriving on time!" The times listed on the calendar (below) are the exact departure times for each train. The arrival show and boarding begin twenty (20) minutes prior to the departure time. If you are not checked-in and boarded by the time of departure you will have to reschedule to another available departure time or date. There are no refunds given to those who miss the scheduled departure time. Groups of 20+ are eligible for a 10% discount in Standard Coach Class only. Use the promo code GROUP20 at checkout or contact us at via phone at 352-742-7200 for assistance. Payment is required in full at the time of reservation. Our Standard Coach Class cars are restored and well maintained Maryland Area Regional Commuter Cars. They have vinyl seating that is arranged by seats of two on either side of the center aisle (Airplane style). If you purchase an odd number of seats, one person in your party will be seated next to a member of another party. This is the only class sold by the individual seat. 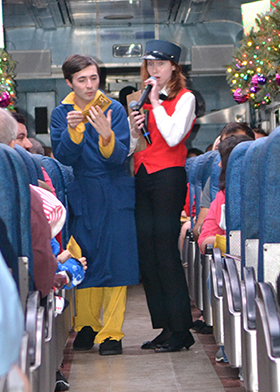 A roundtrip aboard THE POLAR EXPRESS™ Train Ride. A cup of hot cocoa served in a paper THE POLAR EXPRESS™ themed hot beverage cup and lid. Our Custom Coach Class cars are restored and well maintained long-distance passenger cars built in the 1950's. They have cloth seating that is arranged by seats of two on either side of the center aisle (Airplane style). All the seats face the center of the car for the best viewing of the show performance. Due to the nature of the long-distance seating arrangement, this class is sold in pairs to be more comfortable for those in your party. One Souvenir plastic THE POLAR EXPRESS™ Train Ride branded plastic hot beverage tumbler. Comfortable, reclining long-distance style cloth seat. Our First Class car is a restored and well-maintained lounge-style car. It has ultra leather seats that recline, and are arranged in groups of four seats facing each other with a small table attached to the wall between each set. Due to the nature of the table seating arrangement, this class is sold in pairs(even numbers) to be more comfortable to those in your party. 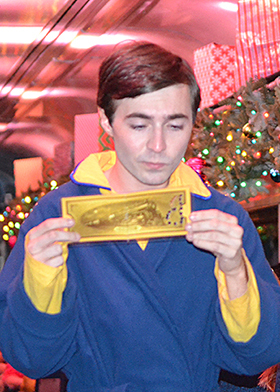 One Souvenir ceramic THE POLAR EXPRESS™ Train Ride branded hot beverage mug. Small table top between each set of four seats. 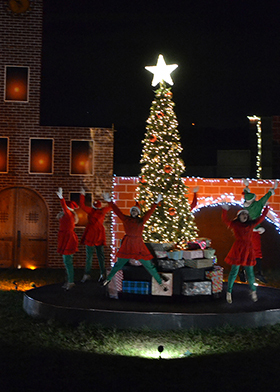 "We did this with our grandkids this year and were totally impressed with the experience. 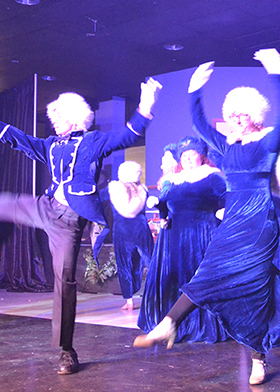 The staff were wonderfully talented and brought you into the story throughout the trip. They made us all true “Believers”. We all left hearing the bells ring"
"Went this year. So much fun. Totally worth it. Will do it again." "It's really nice. Make sure you all wear your pjs family pic💕"
"We had the one of a lifetime experience! They greet you and take a photo, they start with a performance and dancers, and direct you to the train. The performers entertained from beginning to end, kids danced, sang, were read to, and met Santa"
"We did this last weekend. And would do it again. Really enjoyed it." "We did this last week (Saturday night) and had a wonderful time!!! Our 6 year old and 3 year old loved it and are still talking about it!!!" "What a wonderful evening we had. 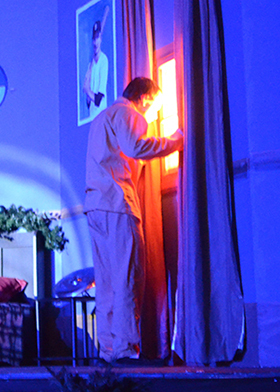 Well done to all the staff for putting on such a great show, not only for the Children but for us adults. Santa was Amazing and even had me believing. So looking forward to next year." 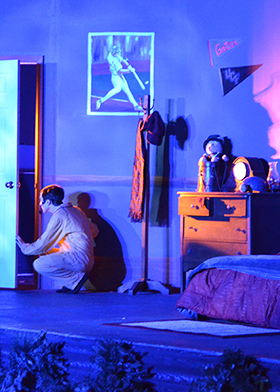 "This was a great show, and the performs did a excellent job. Keep up the great work, Hope to see you in June." "This is a great event! We had a wonderful time! Thanks to all the performers. They are exceptional 😀🎉👏"
"It was awesome and well worth the money. They weren’t above and beyond to help my children believe in the Christmas spirit! Would def recommend!" 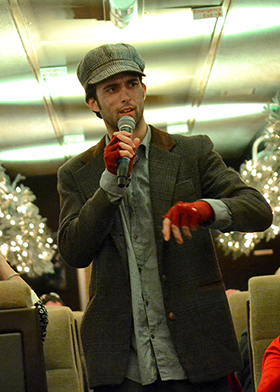 Hop onboard our fleet of beautifully restored, 1940s vintage lightweight passenger cars for a journey back in time. The Royal Palm fleet is fully climate controlled with cool air conditioning to beat the heat of Florida’s scorching Summers.